You and Me, Against the World is the first volume in The Creepers saga, by Raymond Esposito. Mr. Esposito is a long-time fan of Stephen King and Richard Matheson, and has written many short horror stories. You and Me, Against the World is his first novel. A devastating virus has swept the world, changing most of humanity into mindless, ravening monsters in a matter of days, sometimes hours. Even the government’s “extreme measures” could not contain this horrific virus, and the world changed to a terror-filled nightmare overnight. Dr. Russell Thorn is thrust into this new world without warning, and the Creepers ,as the zombie-like victims of the virus are called, lay siege to his home, as he searches desperately for escape amidst the chilling revelation that the Creepers are changing…growing more intelligent. Dr. Thorn’s rescue by a group of young survivors starts him on a desperate quest to find the last safe place on earth. But the evolving Creepers are not the only thing standing in the path of safety. 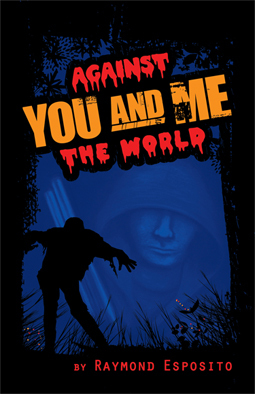 You and Me, Against the World is a chilling tale that zombie fans will love. The action starts on the first page and never lets up. The story is filled with non-stop twists as the group of survivors battles the Creepers and dangers they never imagined in a thrill-packed, blood-chilling adventure. This book had me up half the night reading it. I literally could not put it down! I read a lot of zombie stories–I’ve even written a couple myself–but I loved the unique twist the author puts on his “zombies.” Not to mention how quickly the virus spreads. And the cats…(shudder)…the cats really creeped me out. I found myself watching my own cats a little more closely. You should DEFINITELY read this!